JK's Galleria of Vintage, Classic and Pristine Cars is honored to present a most breathtaking example of pure vehicle design decadence...this is the vehicle of dreams! This is an absolute Amazing 2k mile 1-Owner BMW that is absolutely Stunning Inside and out. It has a Clean Auto Check report and No Accidents. This car runs and drives new and The Manufacture warranty covers you in Full through June 2019 or 50,000 miles. We have all of the original owners manuals, books and Window Sticker. 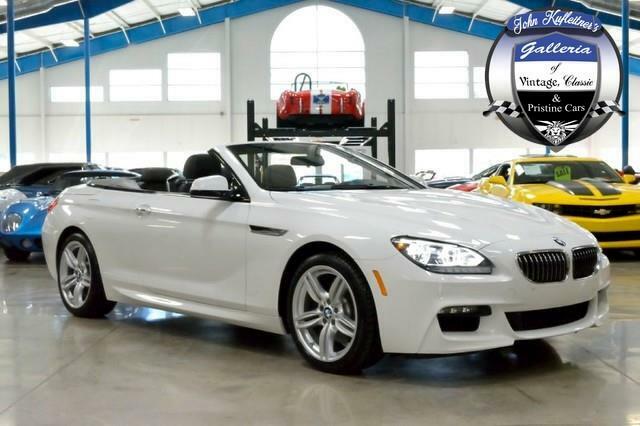 2015 BMW 640i xDrive Convertible Original Window Sticker Options Alpine White Black Dakota Leather M Sport Edition -Soft-Close Automatic Doors -Front Ventilated Seats -Multi-Contour Seats -Ceramic Controls -Automatic High Beams -Harman Kardon Surround Sound -Concierge Services -Shadowline Exterior Trim Cold Weather Package -HeatedSteering Wheel -Ski Bag Executive Package Lighting Package M Sport Package -19 Alloy Double-Spoke Wheels -LED Fog Lights -M Steering Wheel -Aerodynamic Kit M Sport Edition -Adaptive Full LED Lights -Head-Up Display -Dynamic Digital Cluster Dynamic Damper Control Universal Garage-Door Opener Comfort Access Keyless Entry Black Soft Top Rear View Camera Auto-Dimming Mirrors Lumbar Support Heated Front Seats Contrast Stitching Instrument Panel with Leather Ambiance Lighting Park Distace Control Navigation System Satellite Radio BMW Assist eCall BMW TeleServices BMW Online and BMW Apps Advanced RTTI Remote Services Destination Charge Standard Features: Performance and efficiency -3.0-liter BMW Twin Power inline 6-Cylinder 24 valve engine -High-Precision Direct Injection -Valvetronic and Double-VANOS variable valve control Handling, Ride and Braking -Driving Dynamics Control with ECO PRO Mode -4-Wheel Ventilated anti-lock brakes (ABS) with Dynamic Brake Control (DBC) -Dynamic Stability Control (DSC) Including Brake Fade Compensation -Start-Off Assistant -Brake Drying and Brake Stand by features -Dynamic Traction Control (DTC) Exterior -Rain Sensing Windshield Wiper with Adjustable Speed -Xenon Adaptive Headlights with Dynamic Auto-Leveling -Corona Headlight-Rings and Cornering Lights -LED Fog lights Interior Seating and Trim -Power Front Seats with Lumbar Support -Drivers memory Seat Comfort and Convenience -Comfort Access Keyless Entry -Fully Lined Power Softop with Heated Glass Rear Window -Park Distance Control, Front & Rear Audio System -AM/FM/CD/MP3 Player Audio System with HD Radio Instrumentation and Controls -3-Spoke Leather-Wrapped Multi-Function Sport Steering Wheel -USB Audio Connection and Hands-Free Bluetooth Including Audio Streaming -iDrive System with On-Board Computer and Touchpad Controller -Rear-View Camera -Navigation System with 10.2 screen, Voice Command and Advanced Real Time Traffic Information Safety and Security -BMW's Advanced Safety System -Driver's and Passenger's Front Airbag Supplemental Restraint System (SRS) with Advanced Technology -Front-Seat Side-Impact Airbags -Adaptive Brakelights -Anti-Theft Alarm System -BMW Assist eCall with a 10-Year Subscription Warranty: -4-Year/50,000-mile New Vehicle/SAV Limited Warranty -12-Year Rust Perforation Limited Warranty -4-Year/Unlimited Mileage Roadside Assistance Program Original MSRP $ 92,125 Also remember we can facilitate shipping right to your door. We also take anything of value on trade and can obtain financing with almost new car rates and terms up to 120 months!! What that means is the car of your dreams can very easily turn into a reality!